It may be on our doorstep but before today we hadn’t been to Yas Waterworld. We didn’t go during our first few months because we had just returned from Florida, where we had done a number of water parks, and thought that Yas may suffer in comparison. And we’ve been so busy in the first few months of 2014 that this is the first weekend we have really had chance. Actually we could have gone last weekend but the kids didn’t have water shoes (not sure that is the right words for them, but it works for me) and we were advised that the floor would be too hot to walk on in bare feet (which was very good advice). So the plan was we would go today, getting there for opening time so it would be quiet (with it being Friday prayers). This was all conditional on Jo being fit to go as she was going out with the ladies from the compound last night. It was looking increasingly unlikely it was going to happen, then at 9:15am she opened one eye and announced that we had better get ready as we needed to leave in 20 minutes. Earlier in the week we’d ascertained that Henry wouldn’t be joining us (“I don’t like swimming, I’ve never liked swimming, why would you think I would want to come with you”, etc, etc), so the rest of us grabbed a quick breakfast, jumped in the car and headed off. We arrived just after opening and other than embarrassing ourselves arguing with the lady in the ticket booth about a voucher we had, when actually WE (that’s the “royal we”) hadn’t read the small print correctly, getting into the park was pretty smooth. As we had hoped it was quiet at that time of the morning, so we slapped some sun cream on, put our stuff in a locker (cue second embarrassing episode in ten minutes, when I complained that the wrist band they had given me wouldn’t lock the locker like it was supposed to, only to be told politely that the reason for this was that I was trying to use a big locker but sir had only paid for a small locker), and headed to the rides. I won’t bore you with each of the rides we went on, other than to note that they were all great fun. We did the roller coaster, a number of slides of one shape or another, and two lazy rivers (actually one of them was really a very energetic river as a huge wave came rolling along behind us every 30 seconds or so). Archie and Flossie loved it, other than Flossie declining to go on one or two slides, and Archie having a brief “will I or won’t I” moment at the top of a steep, dark ride – he did, he loved it, and we went on twice more. We also splashed about in the main pool area for a while, having great fun when the wave machine was switched on at regular intervals. As the morning progressed the park got busier, the sun got hotter, the party girl started showing signs of relapsing, and we all got hungry and thirsty. We decided to have lunch but before that we stopped to watch the lunchtime show at the small amphitheater in the park. The seats look onto a water tank in which two ladies put on a short underwater acrobatic show, which was pretty impressive. I think I read somewhere a few months ago that at least one of them was in Aquabatique, who were on Britain’s Got Talent a few years ago. Next stop was one of the food outlets for a spot of lunch. It was the normal theme park choices (burgers, chicken nuggets, etc) but the food was of a good standard, and the service was very good (friendly and helpful, and more than happy to give us extra empty cups so we could split drinks and so on, something that wouldn’t have been allowed by the “jobsworths” in other parks we have been to). After lunch the kids spent a happy 30 minutes splashing about in the kid’s play area, whilst Jo and I relaxed and watched them, and then we headed home having had a very enjoyable day. As the day turns to evening we are enjoying a drink on the roof terrace, catching the last of the sun. If we remember we’ll be back out here later to see if we can hear the Justin Timberlake concert from here (he’s playing at Yas Arena tonight), and to see if we can spot any of the Camelopardalis meteor shower (which I am sure I read somewhere earlier in the week is named after ……. a giraffe, explain that one to me) that is due this evening, although I suspect there may be too much light pollution, perhaps we should have planned a trip into the desert. 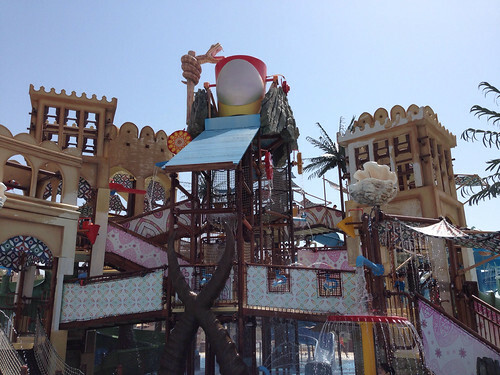 You can find more information about Yas Waterworld here.